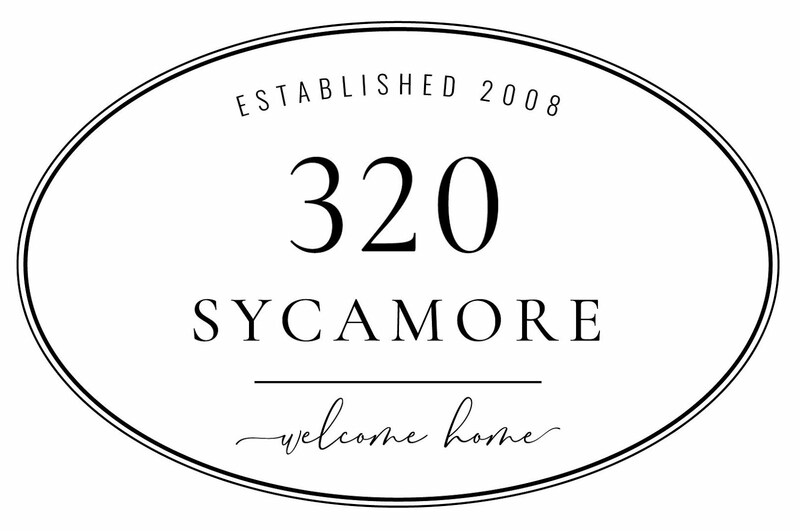 The home tour continues! 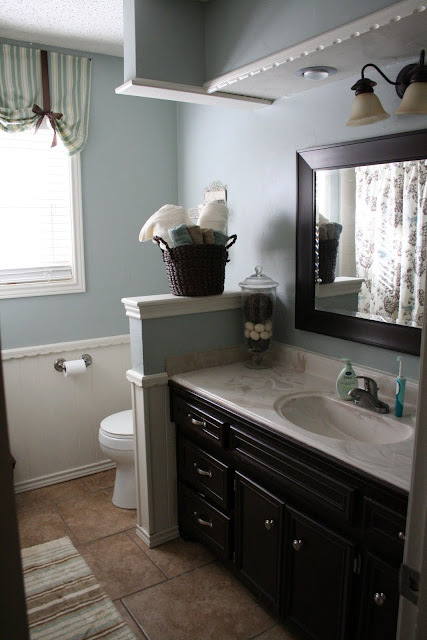 Here is the bathroom when we first moved in~I especially like the touch of the Liquid Drano on the windowsill. Cut out the banisters to open it up and not make it feel so 70's. Most of these are decorative and aren't supporting the wall. We just cut right through the middle and they came out like a charm. Then, fill in nail holes and sand where they were. Removed the shower doors: take out a few screws and lift away. We just caulked the holes where the screws were and used some caulk dissolver (found at hardware stores near the caulk) to get rid of the old caulk along the doors on the edge of the tub. The tub and tile were white (thank you previous homeowners, for not matching the yellow in the wallpaper!! ), and so we just gave them a good cleaning. The rest was removing wallpaper, choosing a right blue-green-gray color for the walls ( I only went through a few samples...). 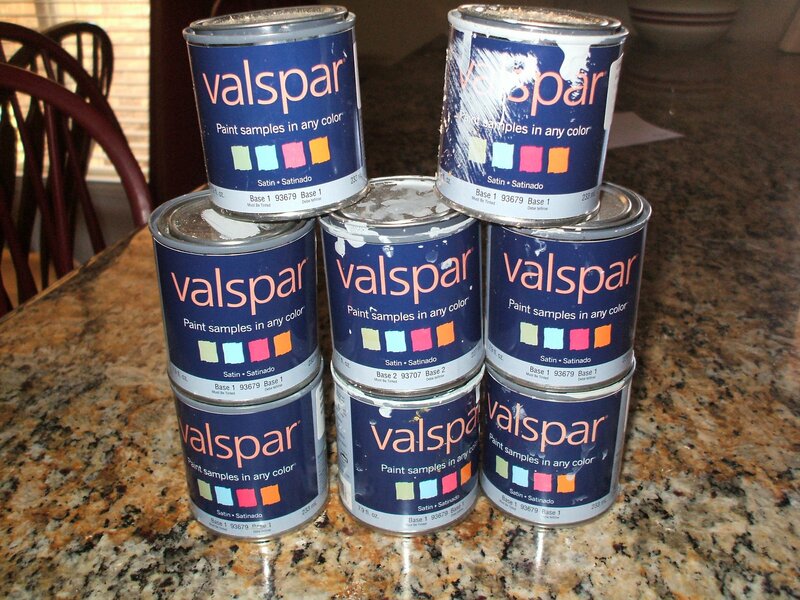 The color we ended up with is basically a cross between Benjamin Moore's Iced Marble and Valspar's Smoke Infusion. The white was just from the 5 gallon bucket we used from the kitchen and rest of the trim in the home. It was colormatched to the existing trim in the bedrooms, so I don't have a name for you. The color we used for the cabinets is Espresso, and can be found at a big orange home improvement store in the quart cans and spray. You can read more details of the bathroom here. Have a wonderful Thursday~this girl is off to pack. Fun times! 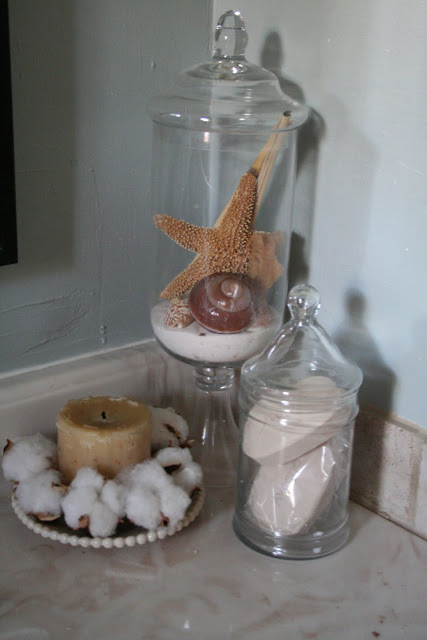 Melissa, your bath room looks absolutely spa-riffic! It's soothing and lovely! 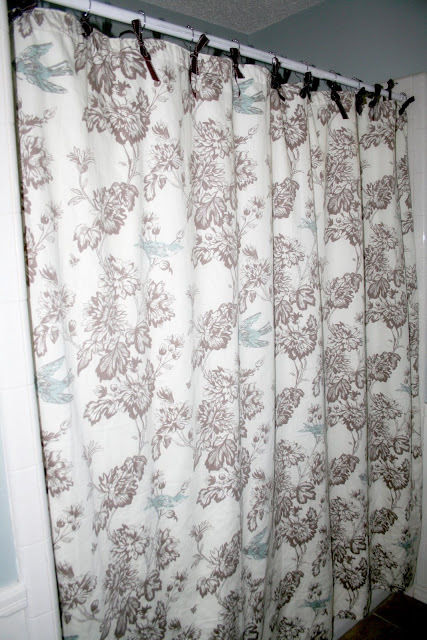 LOVE your paint color and that shower curtain is just beautiful! Amazing! You have great vision, my friend. Beautiful work. What a gorgeous transformation!!! Love the cotton... what a great detail! Amazingly gorgeous! I'm a total sucker for light blue and brown combo and you pulled it off with major elegance. Way to go- hope you love your bathroom now! I have that same shower curtain! i love those birds... And I love what you did with the brown ribbons! I never would have thought of that! 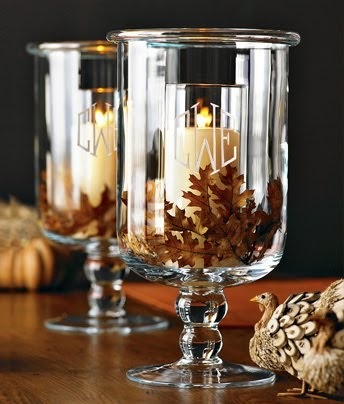 So creative and it adds that extra oomph! WOW! It's GORGEOUS! 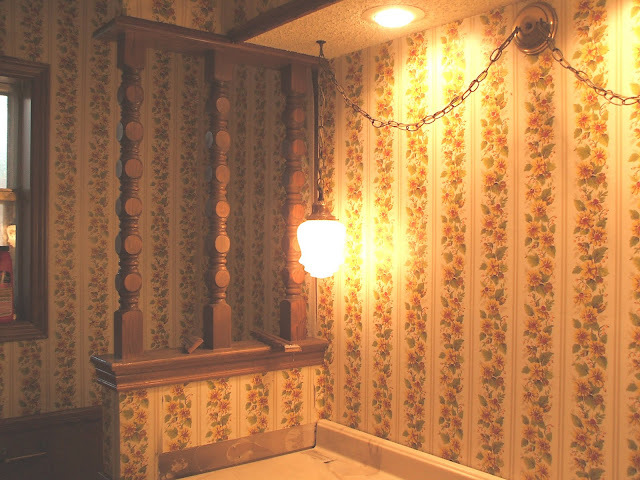 We have a bathroom that's currently even scarier than we hope to renovate soon! I hope mine turns out 1/2 as beautiful as your did! Lovely! Do tell where you got that beautiful shower curtain!! I LOVE it. I hope you got that house for a song, with all the work you had to put into it! It's gorgeous now, though! Beautiful! 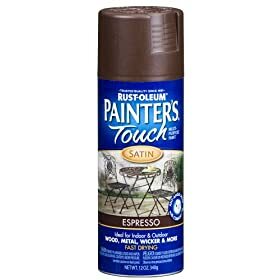 I will soon be moving into a home with lot's of oak cabinetry :( How did you prep the cabinets before using the espresso paint? Also, did you finish them with poly or anything else? I'm wondering how the new paint holds up to wear in tear especially in a bathroom? Please reply in comments. Thanks for all the ideas! Anonymous~ use Zinsser primer found at hardware stores, then 2 coats paint, and yes, I would definitely recommend a poly finish. I was looking at that before picture and just thinking, "gross. I wouldn't even want to go in there." The after picture looks like some luxury spa! You are so awesome! Good luck packing! You certaily had a vision, and what a vision of loviness it turned out to be! 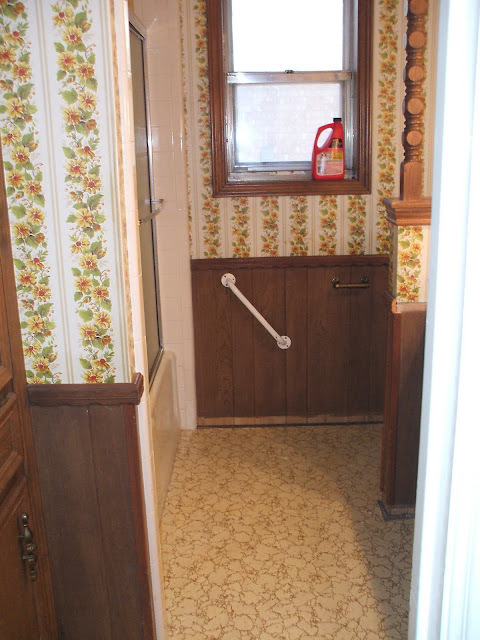 I think I would have ran at the sight of that old bathroom! WOW! I think you did a beautiful job! Love the blue and the espresso cabinets. It must be hard to leave when you've done so much work on the house. I dunno, Melissa, I think you should have found a way to incorporate the Drano into your new design. ;) The final product is beautiful! Love the wall color and it looks so much better without the shower doors! Beautiful!! We have the same kind of banisters in our living room. You've given me a great idea. We also removed the shower doors from our bathrooms, it's amazing what a difference it makes. It really opens it up. Ahh man! I needed an actual name for that paint color! I've been sampling and sampling colors trying to get the right one and yours looks perfect! And where is that shower curtain from??? It would make some gorgeous curtains!!! Oh, Melissa, you'll miss this bathroom, won't you? It's such a beautiful space now. But I just love those before pictures. . . proof positive that you can go from drab to fab without breaking the bank! Even if you're a paint spaz! Hope your packing is going well! Thinking of you. . . .
Wow, I think my jaw is hanging open - what an amazing before and after! The colors you selected are so calming...great space. what an amazing makeover. I would have to say the before bathroom would have to be the ugliest bathroom I have ever seen and you made it beautiful. The colors are so tranquil, I love it. The transformation is amazing! You and your husband made such a huge difference. Wow! What a great remodel. You could see through all the yuck to get to the wonderful. I love what you did. It's just beautiful, Melissa. Love the luscious blue/gray color. I've seen it before but it's miraculous to see again. Such a great job! What a difference! I love the "new" bathroom. It's beautiful! The blue is soooo serene! I love the ribbon bows on the shower rings, very clever! Wow it is so pretty, what a wonderful transformation! Great job! My 8-year-old said that bathroom went from "Bad to AWESOME!" I totally agree! Great job and good luck packing! You did a great job! 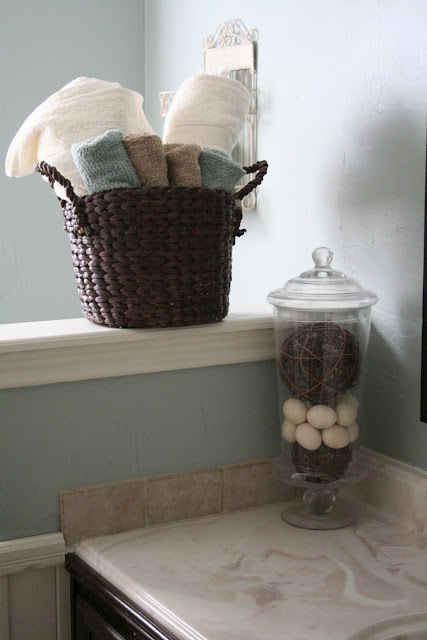 I love seeing makeovers like this -- simple but make a huge impact! I absolutely love what you've done. It looks so calm and relaxing in there. :) Perfect! I'm truly surprised you bought the house with that hideous bathroom, sugar. LOL But the transformation is fantastic. Improves it 100%, chickee. I love it! It reminds me of the ocean but in a very sophisticated way. Great job. Question: we just took out our shower doors as well and now the tub is stained from where the door was. Any suggestions? I LOVE these colors! I was looking for inspiration for our hallway bath and I think I've found it!! Quick question for you though - for the cabinets - did you use can or spray paint? Would you use a primer with the spray? I'm a newbie to the painting world so any tips you have would be much appreciated! Thanks!! 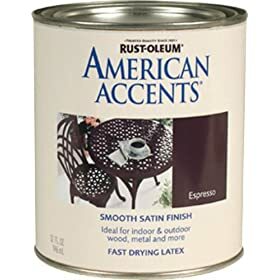 I used the rustoleum paint in the quart cans that match the spray paint at Home Depot. I took the doors and drawers off and spray painted them outside and then hand painted the bases. 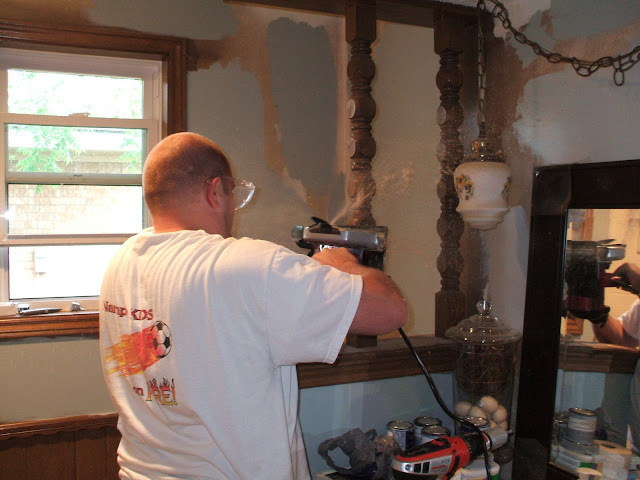 Definitely use a primer~Kilz or Zinsser have some great ones. Hope that helps! 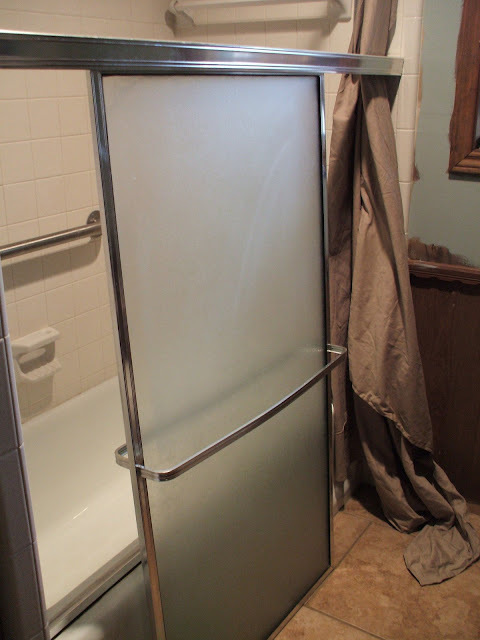 Frameless Shower doors have evolved like every other design feature in today's bathrooms. If you're remodeling or building a full bath, chances are you will be tempted by this attractive design choice. Ordering a frameless shower door is a little bit like building an addition!